Ask any newspaper photographer who has made (or is making) the transition from still photography to video and one of the first things they will complain about is the amount of trial and error that goes into teaching yourself a completely different medium. It’s understandable that most people think if a photographer can shoot great pictures, then it’s fair enough to assume they can produce great video. This is not true, in case you were wondering. About the only thing that still and video have in common is that you point a camera at something for a period of time, capturing images. Everything else, from subject matter to how you handle the camera to the editing process, are completely and utterly different. Unfortunately with the way the economy has been recently, many newsrooms have been forced to learn video on their own. Many photojournalists took four solid years (or more) of training and education to be newspaper photographers but only get four months to suddenly become video experts. All this leads to hours and hours of trial and error. This means taking five tries just to get the right settings on import (you think learning all the numbers and formulas for photography is confusing), then three tries just to get your editing timeline up so you can see your video clips. Then it’s hunt and peck for the right keys to slice, move, control volume, make ending credits (keep in mind this is all really basic stuff). And that’s the frustrating part – once you get over the idea that you’ll never make a Pulitzer prize for your video and that the general public really only wants to see max 2 minutes of video before their Internet-induced ADD kicks in, you still find yourself struggling just to get an easy, almost linear video exported. If you Google “video export” you will get 4 gazillion results all telling you different things. .avi, .mp4, codec, NTCS, key frame, progressive/interlaced, compression settings, MJPEG. Am I speaking your language yet? And don’t get me started with the numbers. It took me 14 tries just to make sure the aspect ratio stayed the same on export. What do 4:3 and 16:9 convert to in pixels? Who knows. Just keep exporting until you get something that looks right. It’s amazing how much time is wasted watching your computer export a thirty second test clip. I could go on and on, but I’m actually getting decent results now, and the Chronicle staff photographers are using me as a sort of guinea pig as we continue to perfect our videos. We’re still not happy with how the Brightcove player (something we don’t really have control over) compresses the video once it gets on the website. Our exported .mp4 is actually really good looking. We’ll get there eventually. Below is a link to a video I made while I spent half a day with a Pre-K class in Augusta for an education cuts story. a spot o’ spot news. Let me preface this post about spot news (unplanned news like shootings, fires, accidents, etc.) with a small disclaimer. We cover the things that happen in and around our community. This means the good and the bad, the glamorous and the not so glamorous. With spot news, it is the nature of our jobs, that inevitably, someone’s misfortune is going to be our ‘good’ fortune. I’ve touched on this before in previous posts and you have to take a small step back to look at the bigger picture. A particular tragedy is very sad for those living through it, however, the public has a right to know what’s going on in their neighborhood. Most newspapers have a certain threshold of spot news that they will give their attention to. In other words, the explosion, fire, whatever, has to affect many people or cause a lot of damage to property – or must be unique in some way as to make it newsworthy (think car crashing through a liquor store window). If we went out to cover every single fatal crash, then we’d truly be ambulance chasers. Every newspaper is different. Some cover spot news like there’s no tomorrow, handing out police scanners to photographers and reporters. Others, and The Augusta Chronicle falls into this category, have one scanner in the newsroom and will only run out if there is something big that warrants it (see above). All that to say, yes, I get excited when there’s a large fire to run to, or an explosion has rocked a pipeline in McDuffie county. It’s a little like EMS workers and how they block out the suffering and pain they see everyday. You get desensitized the more you’re around it. And it’s part of a photojournalist’s moral quandary to decide whether to take a picture of a grieving father or tearful mother. At that moment you realize that this is part of life, and it is a story worth telling. No matter how heartbreaking. It is what we do. But luckily, this picture has a relatively happy ending. As I ran around the apartment complex to get a better look at where the firefighters were actually fighting the blaze, I saw one of the rescuers holding a pet carrier…with a dog in it. I thought to myself, I’d better get ready because at any moment, the owner might come screaming out from nowhere, hugging and kissing the dog from the joy of being reunited. Ninety percent of our job is anticipating what’s going to happen. I had been in such a rush to get to the scene that I hadn’t put a memory card in my camera yet, and so had to fumble around in my pocket for one. As I was closing the door to the card slot, the woman I was hoping for made her appearance from a neighboring apartment building. “Oh Reeses, Reeses!! !” I could hear. I had no time to format my card and just started shooting without knowing how many frames I had left. It could be 4 or 400. I didn’t know. Stressful. 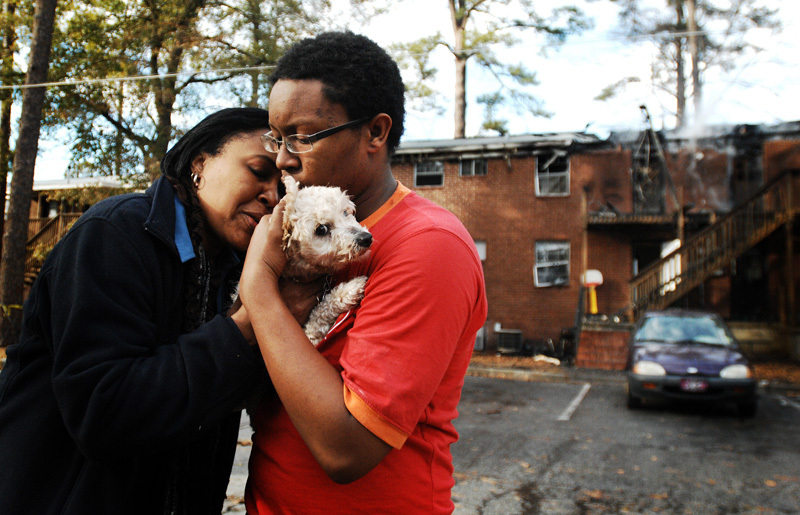 I clicked away as her son arrived and I backed up as they moved away from the burned out apartment. This is when I made the picture. It’s a clean frame with noone else around for distraction, and I was close enough to use a wide angle lens – something that’s unusual for spot news. A small group of onlookers were gathering around us, and I continued to back up until my left leg stepped on – and fell through – a rotted out tree stump. For about three uncomfortable seconds my leg was buried up to my thigh in a hole that felt like it didn’t have a bottom. I knew I had scraped my calf pretty good, but the adrenaline was pumping so it didn’t really matter. I managed to get myself up and thankfully was unnoticed by anyone else in all the commotion (I think?). By then the moment had passed, but I knew I had something good. No injuries were reported. Including mine.